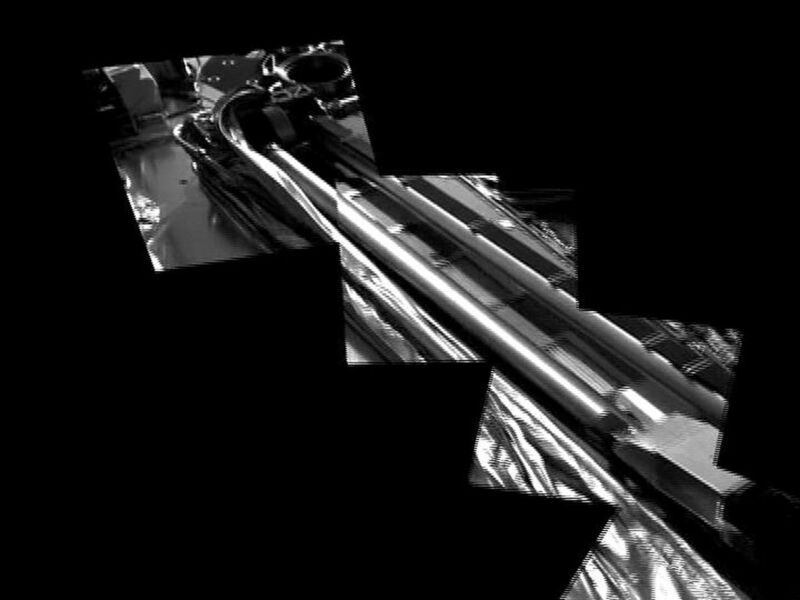 This movie from NASA's Phoenix Mars Lander shows the spacecraft's robotic arm in its stowed configuration, with its biobarrier unpeeled. 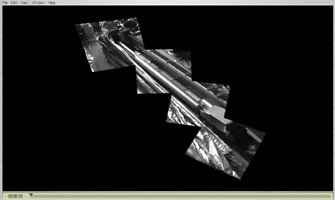 The arm is still folded up, with its "elbow" shown at upper left and its scoop at bottom right. The biobarrier is the shiny film seen to the left of the arm in this view. The barrier is an extra precaution to protect Mars from contamination with any bacteria from Earth. 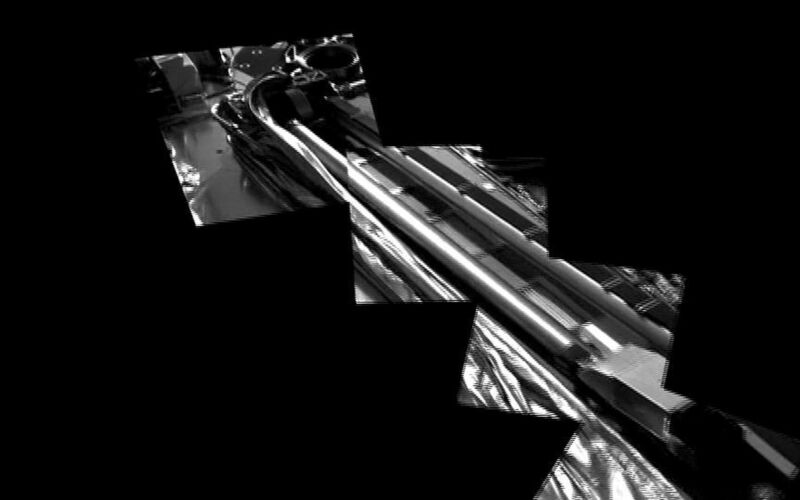 While the whole spacecraft was decontaminated through cleaning, filters and heat, the robotic arm was given additional protection because it is the only spacecraft part that will directly touch the ice below the surface of Mars. Before the arm was heated, it was sealed in the biobarrier, which is made of a trademarked film called Tedlar that holds up to baking like a turkey-basting bag. This ensures that any new bacterial spores that might have come about during the final steps before launch, and during the journey to Mars, will not contact the robotic arm. After Phoenix landed, springs were used to pop back the barrier, giving it room to deploy. 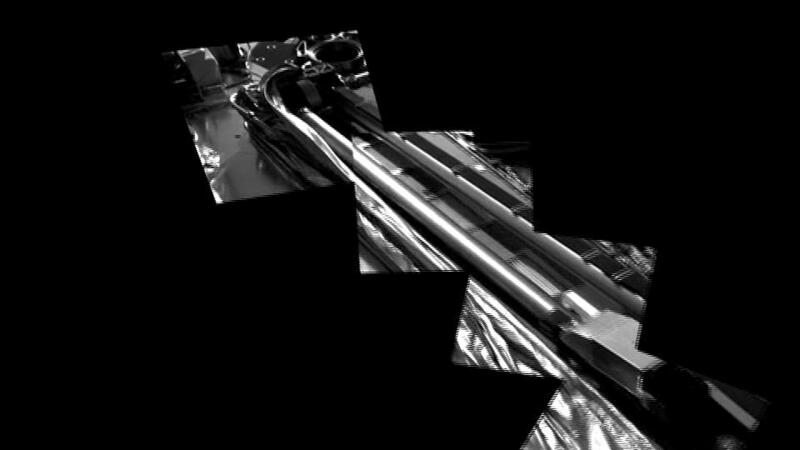 The arm is scheduled to begin to unlatch on the second Martian day of the mission, or Sol 3 (May 28, 2008). This image was taken on Sol 1 (May 26, 2008) by the spacecraft's Surface Stereo Imager.